Chiba Institute of Technology future robot technology research center (fuRo) Japan, has developed a new resuce robot named “Hibiscus” because of its elegance. It’s main purpose is to look for survivors in case of disasters like earthquakes which are common in Japan. The robot has infrared thermal camera which can detect trapped survivors in the rubble by their heat signature. It has a max speed of 1.1 meters per second, communicates via Wi-Fi 802.11g and is powered by a SH-4 processor. 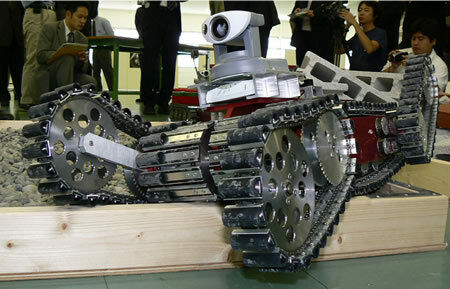 It has six independent crawlers and has two flipper arms which allows it to move over obstacles effortlessly. The Hibiscus measures 370 x 650 x 180 mm and weighs 22.5 kg. It is powered by a 3700 mAh Lithium Polymer battery which lasts for 60 minutes. The Hibiscus costs 3000,000 Yen ($ 26,800).